"There is no greater mission, across the SUNY system, than working with partners in our regions to prepare our graduates for their roles as leaders in our dynamic New York State economy." 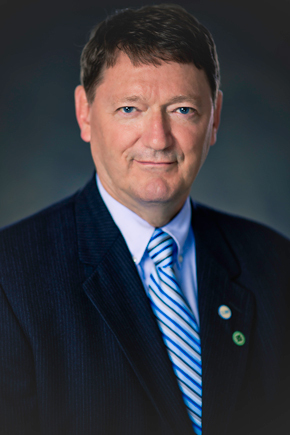 Dr. David E. Rogers, was named eighth president of SUNY Morrisville in June 2015. Throughout a 16-year career at SUNY Morrisville, Dr. Rogers has earned the respect of the campus community and helped make the college a top destination not only for prospective students but for talented faculty and researchers, as well as businesses seeking partnership with higher education. Prior to Morrisville, Rogers was the director of Institutional Research and Planning at Onondaga Community College, and has held faculty positions at Ithaca College, the University of Wisconsin-Milwaukee and Le Moyne College. Instrumental in the college’s strategic planning process, Dr. Rogers also helped secure SUNY 2020 and High Needs Grants in excess of $6 million. Additionally, he has served on numerous campus committees and community and college boards. SUNY Morrisville has the responsibility and opportunity to create a campus environment that is affirming and welcoming to students. We are a community in which hardworking, diverse people challenge each other in a respectful, civil manner. We denounce individuals and groups who promote fear and violence and refuse to give them space to divide or do harm to any of us. The events of the past week in Charlottesville are disturbing to many of us who study, educate, and work in higher education. These moments are the antithesis of the mission of the academy and of SUNY Morrisville. We reaffirm earlier statements by our Governor Andrew M. Cuomo, as well as SUNY Chairman H. Carl McCall and Chancellor Nancy L. Zimpher. We echo, Governor Cuomo’s statement, “New York has long understood that our diversity is our strength, and that we are only able to be who we are because of the breadth and range of our ethnic and cultural make-up.” We believe SUNY Morrisville represents the positive outcomes diversity can bring to a campus. As we all prepare for a new school year, we reassure each of our students, faculty, staff, families and alumni that SUNY Morrisville is committed to providing a safe, welcoming and caring environment where people are valued, respected and included. We are committed to engaging in thoughtful dialogues to share and understand our unique experiences and perspectives at Morrisville. You are an integral member of our community. Your resilience and tenacity are what make us Mustang Strong. This is your home and your place of work- please know as your College President I am committed to building a community that values and supports its members. There will be opportunities for us all to engage in thoughtful dialogues to build greater understanding and common ground. If you have any questions, please feel free to reach out to me directly or to our Chief Diversity Officer, Mary Bonderoff.